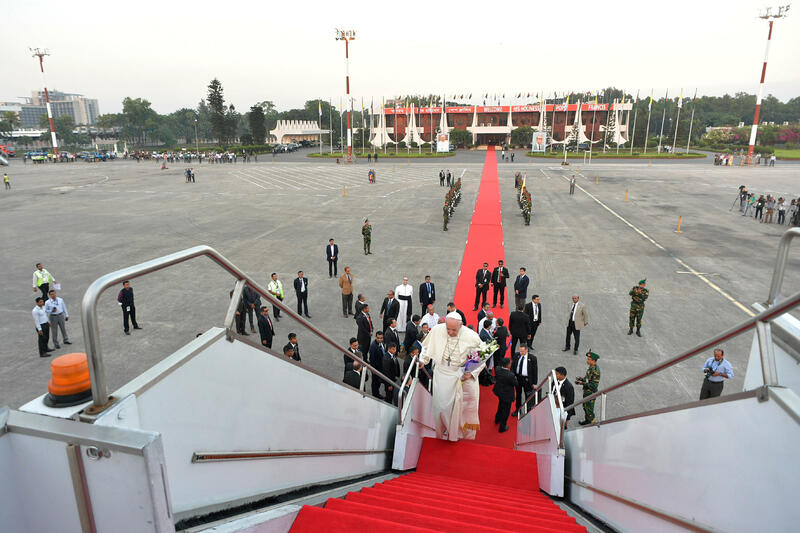 Pope Francis departed Dhaka International Airport on December 2, 2017, completed his apostolic journey to Myanmar and Bangladesh, which started November 26, 2017. AS I DEPART BANGLADESH FOR MY RETURN TO ROME, I OFFER RENEWED THANKS TO YOUR EXCELLENCY, THE GOVERNMENT AND ALL THE BELOVED PEOPLE OF BANGLADESH FOR YOUR GENEROUS WELCOME AND FOR THE MANY KINDNESSES SHOWN TO ME DURING MY VISIT. WITH THE ASSURANCE OF MY CONTINUED PRAYERS FOR YOU, I INVOKE THE ALMIGHTY’S BLESSINGS OF HARMONY AND PROSPERITY UPON THE NATION.